Don't forget to use recyclable materials and inexpensive projects when making homemade Christmas gifts. Save old Christmas cards, felt scraps, and wine corks to create these inexpensive and adorable projects. Recycled craft ideas help you save money during an expensive season. Plus, you don't have to make a stressful trip to the craft store for supplies. Avoid the holiday rush and enjoy more time crafting with these fabulous Christmas craft gift ideas. The holiday season is full of reasons to celebrate, so why not give a few recycled homemade gifts to show you care? You don't have to look far for great Christmas craft gift ideas because there are so many options you can create on your own. Get in the holiday spirit and create a few homemade Christmas ornaments, decorations and more. Instead of hanging them on your tree, wrap up your creations and give them as a gift. Every year, your gift will get hung on the tree and will bring meaning to the life of the recipient. Make a few of each project so you can keep and display your own work and give items away, too. 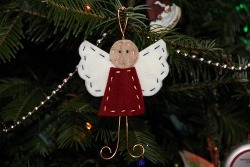 Felt and Wire Angel: Save up your felt scraps for this lovely little angel craft. You can string one up and hang it on your tree or add it to a gift for a fun little touch. Use a simple running stitch to sew the felt together - this is a great project if you're new to the world of sewing. The best Christmas ornament craft ideas should be fun and simple, not stressful and this project really fits the bill. Don't be afraid to work with wire, either. For this project, you can simply twist and fold the wire to form the shape you want. Fun Felt Ornaments: If you have some red and green felt scraps laying around, use them to create some simple and pretty homemade Christmas ornaments. Use a needle and thread to sew on beads, sequins and more - this is a simple way to turn a plain ornament into a one-of-a-kind design. You can also make a plain poinsettia ornament that's understated and pretty. Give some of these ornaments as homemade Christmas gifts - you can make a bunch in an afternoon and give one to each of your friends. Christmas Card Saver: It's so hard to get rid of sentimental items like Christmas cards. Instead of throwing them in the trash, save them and make your own card saver. 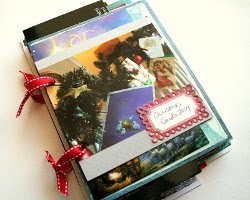 Add holes to sides of the cards and add binder rings or ribbon. You can cut the cards into two seperate pieces so the book will easily open. You can even make your own cover using a piece of chip board. This is a simple and fun way to get organized once the holiday season is over. Homemade Photo Ornament from Christmas Cards: Another simple way to repurpose old Christmas cards is to create homemade Christmas ornaments. Cut the cards into squares and fold them to create a geometric shape. Use a piece of twine to hang the ornament on your tree and add phots to really personalize the project. No need to buy more paper or cardstock for this project - you can use what you have and save cards for years to come. Everytime you look at your ornament, you'll be reminded of the person who sent the card. Recycled craft ideas can be so meaningful, especially when you use special, sentimental items. 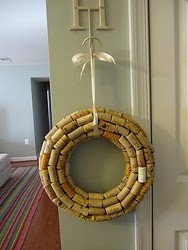 Wine Cork Wreath: Christmas craft ideas have never looked of tasted this good. Enjoy a delicious bottle of vino and save the cork to create a decorative wreath. You only need a Styrofoam wreath form, hot glue and wine corks for this project. If you like to make recycled crafts, then you'll have a ball working on this simple Christmas craft. This project is perfect for beginners but looks expensive. Remember, if you enjoyed these 5 recycled craft ideas for Christmas, then you'll love getting even more projects in our free eBook, 7 Thrifty Christmas Craft Ideas. I have to say that I am super partial to the holiday card folder. I love that you can take the cards and make them a centerpiece on your table instead of hanging them up. I want people to look at the cards and appreciate what people say in them. Do you like to read through all of your cards after the holidays or on Christmas Eve too?